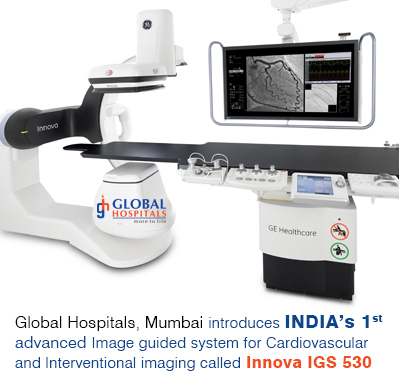 Global Hospitals Mumbai introduced the India's first image guided system for cardiovascular and interventional imaging called Innova IGS 530 Cath Lab in association with GE Healthcare. This is the latest and the most advanced cardiovascular and vascular X-ray system which provides excellent imaging performance for a full range of interventional x-ray and provides best diagnostic for angiograms, device placement and non-vascular procedures. The Innova IGS 530 is expected to help in viewing anatomy more clearly, making it suitable for cardiac, electrophysiology, neurology, angiography, peripheral angiography and intervention. In other words provide a patient-focused user friendly interface. 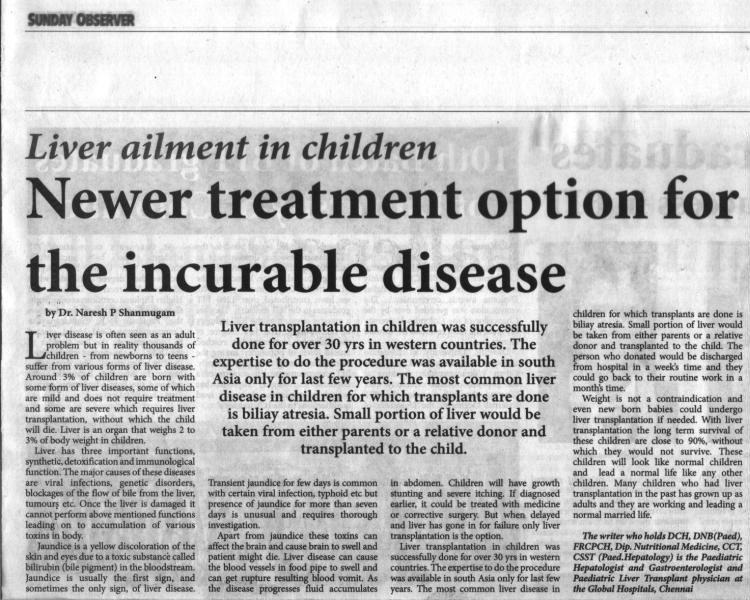 On the occasion of World Liver Day, BGS Global Hospitals, Bengaluru, INDIA had organised a Free Health Camp in the name of a liver donor - Late Mr. Parthiban. The camp was organised at Viveknagar, the residence area of the Mr. Parthiban. The Chief Guests for the day were Mr. Syed Kirmani and Rotarian Amarnath who spoke on the importance of donating one's organs and also expressed gratitude towards Mr. Parthiban's family for coming forward and supporting BGS Global Hospitals to organise this camp. Son and daughter of Mr. Parthiban also expressed their views by thanking BGS Global Hosptials for oganising this health camp and also conveyed their happiness that their fathers organ has helped someone else live. Dr. Sonal Asthana in his short speech expressed the fact that BGS Global Hospitals is the only hospital promoting Organ Donation very actively and like Late Mr. Parthiban all should come forward and donate one's organs. Dr. Mathew Jacob said that it is extremely difficult for a family to decide during his last moments about donating their loved ones organs. Mr. Parthiban's family had the extreme courgae and sound mind to take the decision hereby helping the recipients families as well. The first of its kind in India which is also affiliated with international association of laryngectomees. The program was Inaugurated by the Addl Director General of Police Shri A.M Prasad in the presence of Chairman and Managing Director Dr Ravindranath and Vice chairman Dr Venkataramana. The program was attended by 30 laryngectomy patients, who actively participated to initiate this club. This club will bring together surgeons, patients, speech therapists and other support groups under one roof to help improve patient care and service. 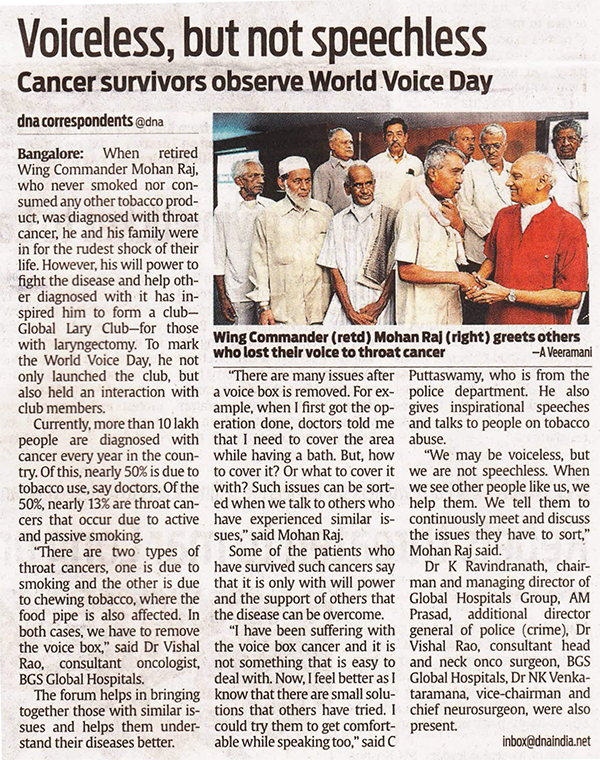 Mr. Mohan Raj, Rtd wing commander from Air force who is the convener of the club, spoke about his experience of losing his voice to laryngeal cancer and how Dr Vishal Rao helped him to connect to his voice. Panel discussions were conducted by patients on life after laryngectomy, and many patients spoke about their stoma related and prosthesis related issues. Patients were trained on the options of using hands free devices, stoma care, electro larynx and patient specific issues.